Outdoor Power Equipment (Lawn Mowers, Snow Blowers, Chain Saws and more) Discussions > Re: New Honda 2-stage Snowblower in testing? 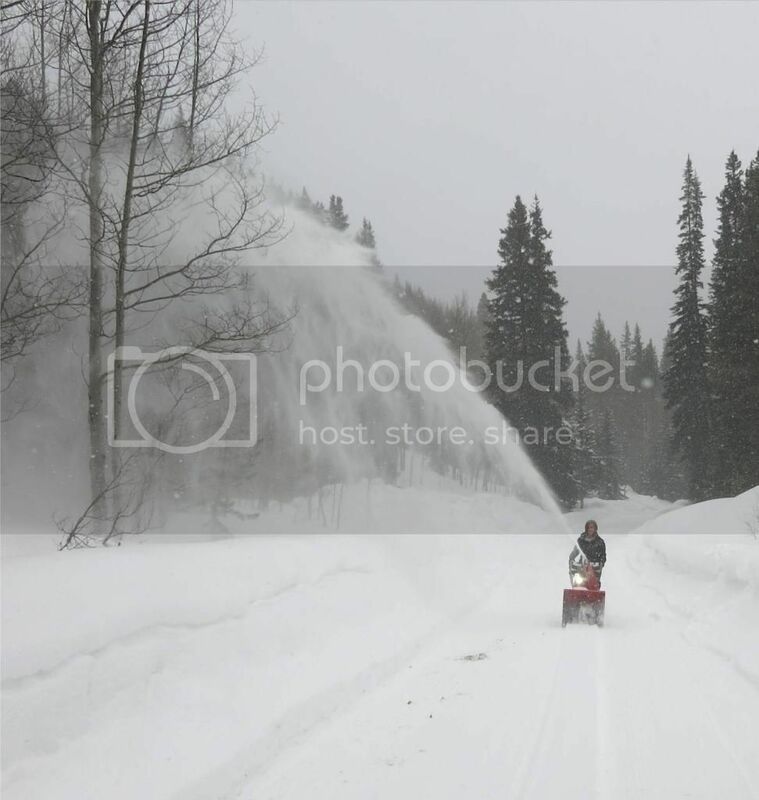 Re: New Honda 2-stage Snowblower in testing? No firm word on models, features, test results, etc. at this time. American Honda Motor Co., Inc. has previously indicated during last year's press event at the Swepsonville, NC factory that new 2-stage models would indeed start begin manufacturing at the plant, which already makes all North American single-stage models. Watch this space for more details as they become available. I work for Honda, but the preceding is my opinion alone. An engine that needs partial choke to run smoothly means it is running lean (too little fuel, or too much air, or both). Most often, it is restricted fuel flow due to slime/gunk in the main jet / nozzle area, and this can happen with fuel that is more than 30 days old. Was the new carburetor a genuine Honda carb, or aftermarket? There are a number of gaskets, insulators, etc. when fitting a Honda carburetor, including one with a tiny vent line. They can easily be installed backwards or upside down. 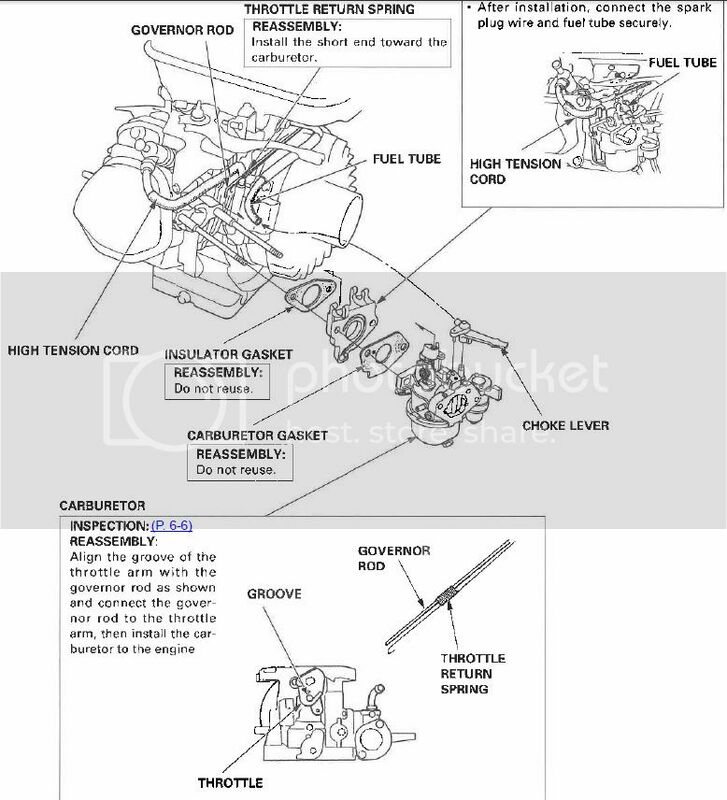 Double check these, as well as the correct holes for the governor rod and throttle return spring. Caveat: I work for Honda, but the preceding was my opinion alone. Outdoor Power Equipment (Lawn Mowers, Snow Blowers, Chain Saws and more) Discussions > Re: Snow blower Honda HS80 WA Wheel drive axle bearing replacement - How ? 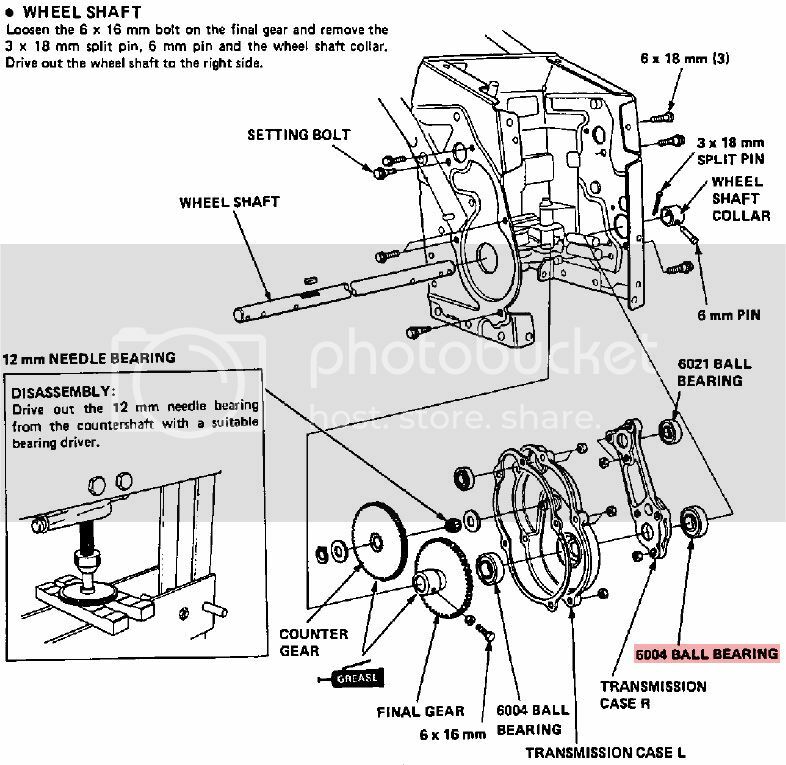 Re: Snow blower Honda HS80 WA Wheel drive axle bearing replacement - How ? My HS80 WA (wheels, not tracks) broke the right side wheel bearing. I found a replacement part but when I look at the machine and the drawings for it I am nervous about my limited mechanical skills. It looks like I may need to take the entire transmission out and apart in order to replace the bearing and reverse assemble to fix it. With that possibility I bought (2) of the bearings to replace both sides. But, looking at this machine makes me wonder, is there some way to get the wheel drive axle out so I can replace those 2 bearings without taking the whole machine apart? Anyone been there, done that? If you have some knowledge of this machine I could use advice right now. Snow coming soon. Is this is a job for a modestly skilled man with tools to try? Cannot afford to destroy this machine in the process. 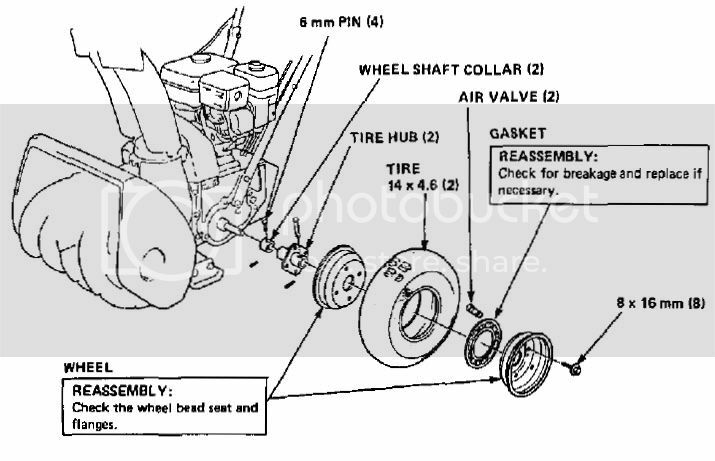 Looks like there is a "tire hub" on each wheel; not sure if they have an actual bearing inside or not, but can be removed after the wheels are off; is this the part you need to replace? Outdoor Power Equipment (Lawn Mowers, Snow Blowers, Chain Saws and more) Discussions > Re: New single stage snowblowers for the US market ! Go RED buckets. Re: New single stage snowblowers for the US market ! Go RED buckets. Just to clarify, there are three new single-stage throwers from Honda. Like the AM, but adds Snow Director: remote control of chute rotation and discharge angle. Before mowing, always check the condition of your blade(s). 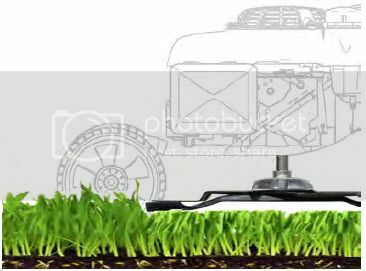 A dull blade will tear the grass and require additional power from the engine. Also, the lower blade on twin-blade models works like a fan. If the raised or lift area of the blade is worn, air flow will be reduced and cutting performance will suffer. Be sure to refer to the owner's manual that came with your lawn mower for specific instructions for inspecting, sharpening, removing, and reinstalling your blades. Always use the correct blade(s) for your lawn mowers' model. Honda blades are carefully designed for specific models. Don't use after-market or "universal" blades. Doing so could also result in poor cutting performance and more importantly, an unsafe condition. If you look closely, you'll see that most grass has stems and leaves. If you cut off the leaves, you'll scalp the lawn. Let the grass recover between mowings. If your grass gets too tall, cut it once at the highest mowing height setting, then mow again in two or three days. Don't take off more than one third of the total grass height in any one mowing, or brown patches may develop. Most lawns need mowing at least once a week. Most grasses should be mowed when they have become 1/2 to 1 above their recommended height. Consult a local nursery or lawn and garden center for mowing height recommendations for types and conditions in your area. Rotary mowers cut and lift grass best at full throttle. Use full throttle even when the grass is short or thin. 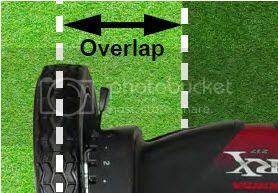 To slow the ground speed of the mower, adjust the transmission to a slower speed or push the mower more slowly. Do not reduce the throttle setting to slow the ground speed. Wet grass clippings will tend to clog the mower deck, and they will lie in clumps on the lawn. Always wait for wet grass to dry before mowing. If you experience clumping, use a leaf rake to remove the clumps and prevent brown patches. If the ground is too dry, mowing will stir up a lot of dust. Besides being unpleasant to work in, too much dust will clog the engine's air filter. To minimize dust and fine particles from passing through the grass bag fabric, it is best to mow grass in the morning when the ground is slightly damp and the grass is dry. Bagging should be considered where you want the area to be clear of lawn clippings, such as around a swimming pool or patio. 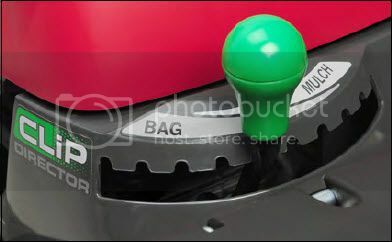 Because the grass bagging works much like a vacuum cleaner, the grass bag must allow air to flow through it; a clogged grass bag will not work well. Always empty the grass bag before it becomes full. Wash a dirty grass bag with a garden hose, and allow it to dry completely before use. Mulching cuts the grass clippings into smaller pieces that fall through the turf more easily and decompose quickly. This returns nutrients to the soil and reduces the need for raking, bagging, and disposal. For best mulching results, mow the lawn frequently, cutting off less than one inch of grass each time. During the growing season, you will probably need to mow the lawn twice each week. Reduce your forward speed when mowing thick, dense grass. You can also overlap the cutting swaths instead of cutting a full swath with each pass. This will improve mulching performance and reduce the load on the engine. Mulching requires more attention to operation and maintenance than other kinds of mowing. It's very important that the grass clippings get cut into small pieces and are distributed on the lawn without clumping. You can use the Versamow feature to take advantage of the benefits of mulching and bagging at the same time. Simply install the grass bag and position the Clip Director in the middle of the adjustment range. Now a portion of the clippings will be mulched and returned to your lawn to provide additional nourishment and a portion will enter your grass bag. Simply move the Clip Director in each direction to achieve your desired results. When mowing thick dense grass, you may need to open the Clip Director farther (more bagging) than you do when mowing thin grass. Use different mowing patterns to train the grass to stand up straight and prevent tire tracks or grooves from forming in the lawn. Alternate between horizontal, vertical, and diagonal patterns to get the best cut quality. See example A. The most common cut quality complaint is a trail of grass clippings that collects on one side of the mowing swath. This problem can usually be prevented by following the mowing tips previously mentioned. However, if the problem persists, use a circular cutting pattern and overlap the previous cutting swath by a few inches. If a trail of clippings is forming on the right hand side of the mowing swath, use a clockwise pattern. If a trail of clippings is forming on the left hand side of the mowing swath, use a counterclockwise mowing pattern. See example B.